The translation dialog box is only shown when you open it manually by clicking on the menu command: MetaTexis | Navigation | Activate dialog box mode. The translation dialog box is shown always, except when it is necessary to work in the document mode (see Dialog Box Mode). The translation dialog box is shown when a database search is started (manually or automatically). 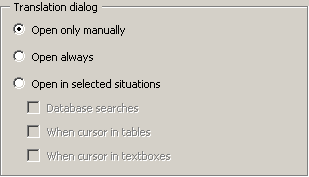 The translation dialog box is shown when the current TU is part of a table. On slow computers, table operations can be slow in document mode, and are faster in dialog box mode. The translation dialog box is shown when the current TU is part of a text box. Some text boxes are too small for a TU to be displayed completely, especially as regards the "last" TUs in a text box. These tend to be displayed beyond the text box boundaries so that they cannot be edited unless the text box height or width is changed. You can avoid these problems by editing text box TUs in the translation dialog box.